Let me open by saying my own personal aspirations for kicking game winners after the siren ended with the realisation there was just no room for a slow, lanky and uncoordinated player in the modern game. However, working as a sports trainer for the local Williamstown CYMS football and the VFL Umpires over 5 years meant I wasn’t only able to live vicariously through the players I would treat and rehab; I also began to see common issues players would pick up and carry throughout the season. As such, after what would no doubt have been a long and gruelling pre-season, I’ll attempt to shed some light on key tips and knowledge that can help players and trainers gunning for an injury free, high performing season. Moreover, whilst these tips are discussed with respect to aussie rules, the majority can be extrapolated to any sport. Let’s kick things off with a common pelvic dysfunction. Whilst many players focus on glute activation, glute med and min are oftentimes left behind for their bigger brother glute max. Often referred to as the “small glutes”, these two muscles lie underneath glute max and attach from the pelvis to the top of the femur. Where glute max is a primary hip extender, both med and min work together to abduct the hip and prevent adduction and internal rotation of the hip. Think of these as critical stabilizers of your hip and pelvis. They also contribute to low back stability and can offset tension held in the glute max when it tries to compensate for their insufficiency. As can be seen below, weakness in the glute med and min muscles can lead to substantial biomechanical deficits in the low back, leg, ankle and foot. This means that acute and/or chronic injuries such as plantar fasciitis, patella tracking syndrome, shin splints, osteitis pubis, etc. can all originate from weakness in the small glutes. So, what’s the best way to switch these guys on? Stretching the adductors is critical before jumping into any activation. Think of the muscles of the pelvis as being like a see-saw with adductors and small glutes being linked at either end of the line (see below left). These two muscle groups perform opposing functions (see above right). So, if we have tightness at one group, the other won’t be able to activate properly due to the restriction generated. This is much like a heavy load at one end of a see-saw preventing the other end from dropping. As such, perform adductor stretches for 3 reps per leg of 15 second holds. 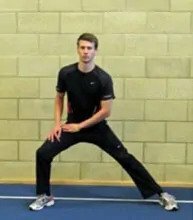 This will help balance the two groups better and allow the small glutes room to activate. Below are two exercises aimed at activating the small glutes. Carry at least one of these out once per day (3 sets of 10 reps, each leg). Bonus Tip: Incorporate these into your warm up before training or a game for best results. Add a resistance band or theraband (place around legs, above the knees) to the above to develop the small glutes even more. You’ve now progressed your small glute training from activation, through to strength development and functional implementation. Stay tuned for more Osteopathic tips and tricks to help keep your season kicking along.